Is there anything better than Christmas cookies? I love to bake during the holidays, and I love decorating cookies even more - especially when my kids can help. There are so many fun reasons this time of year to make cookies - holiday parties, gifts, and of course, a plate for Santa. But as much as I love to bake from scratch, I'll let you in on a little secret. My favorite holiday cookies aren't from scratch at all. These easy Christmas cookies are a delicious, fun to decorate treat that works for all of your holiday cookie occasions - and they are definitely Santa approved! Assorted holiday decorations - sprinkles, colored sugar, etc. 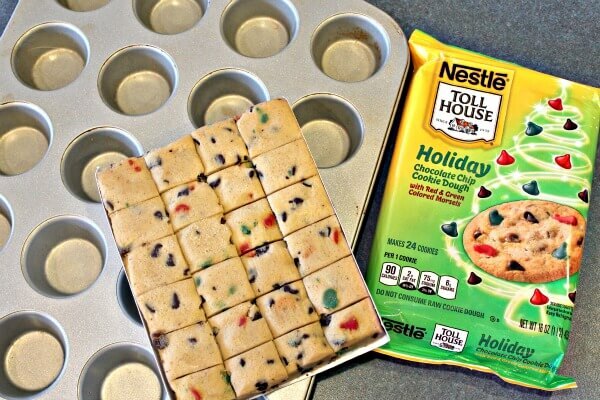 Break your Nestlé® Toll House® Refrigerated Cookie Dough into 24 pieces, and place one inside each cup of a mini muffin tin. 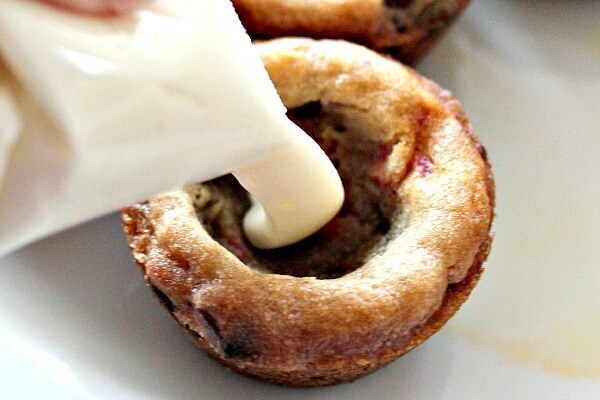 Use the back of a spoon to press each piece of dough into the muffin cup, making a small indentation in the center. Bake at 350 degrees for 10-12 minutes, or until cooked through. 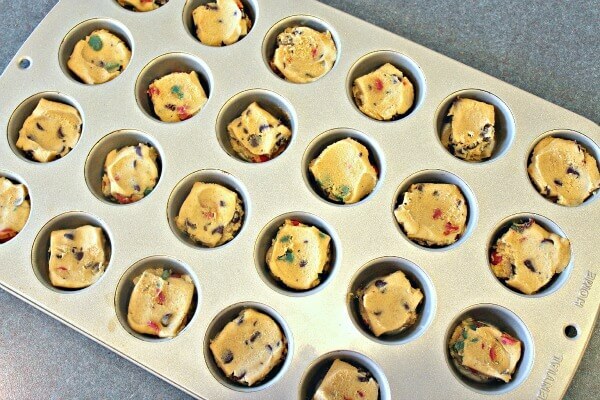 Remove the cups from the oven, and use the handle of your spoon to make a well in the center of each cookie. Allow to cool. 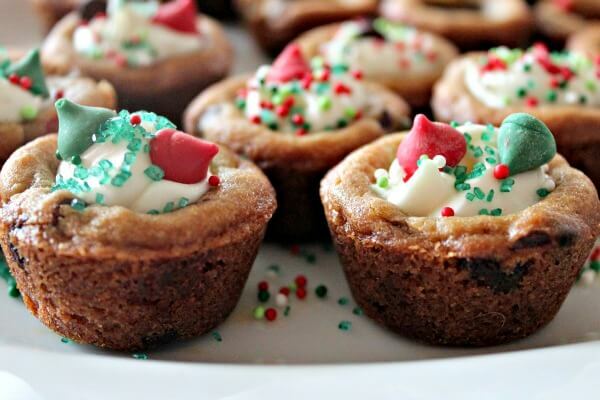 Once your cookie cups have cooled, gather your frosting and decorating supplies. Place the frosting inside a pastry bag if you have one. If not, do what I do and spoon the frosting into a gallon size freezer storage bag, seal, and snip off a corner. 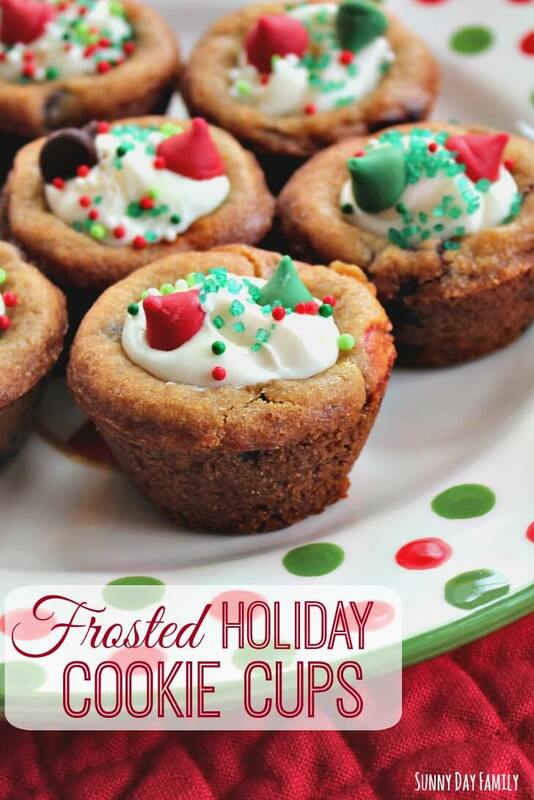 Carefully fill each cookie cup with frosting. 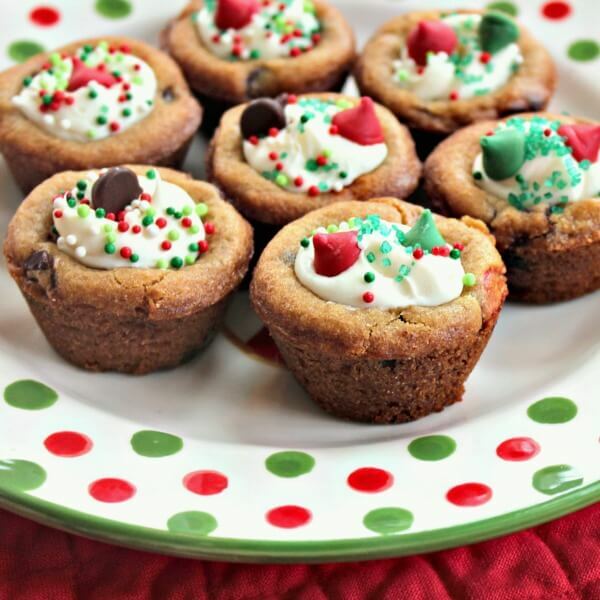 Then decorate each cup with your Nestlé® Toll House® Morsels, sprinkles, and colored sugar. Be creative and have fun - my kids love this part! All finished! And since you use Nestlé® Toll House® refrigerated cookie dough, it takes all the guesswork out of baking and you know your cookie base will be just right for your creations. Perfect for baking with kids - it lets you concentrate on decorating and having fun! 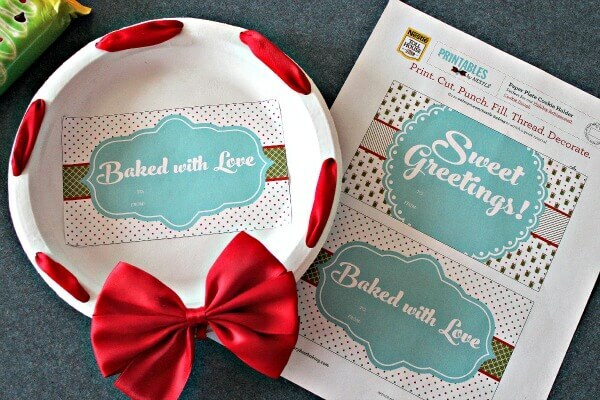 Get the free printable for this adorable gift plate with instructions too - click here! Want the perfect serving tray for your Christmas cookie cups? 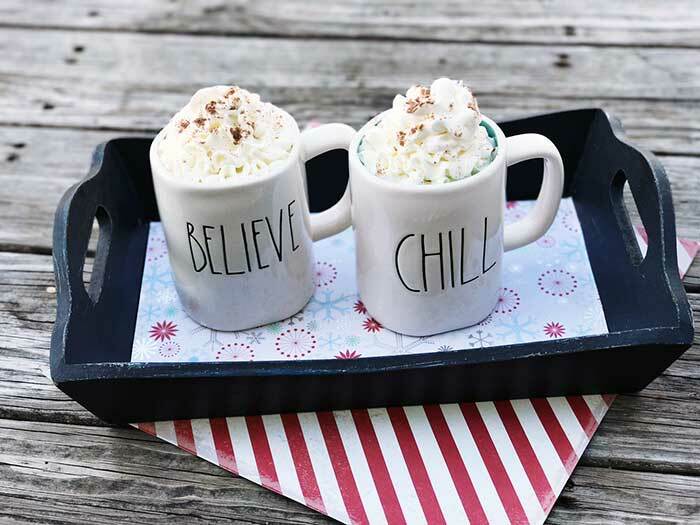 Click here to see how to make this adorable DIY holiday tray! Looking for more holiday baking ideas? Check out the Flavorful Moments Pinterest Board! Browse all the awesome recipes and let me know your favorite in the comments below. 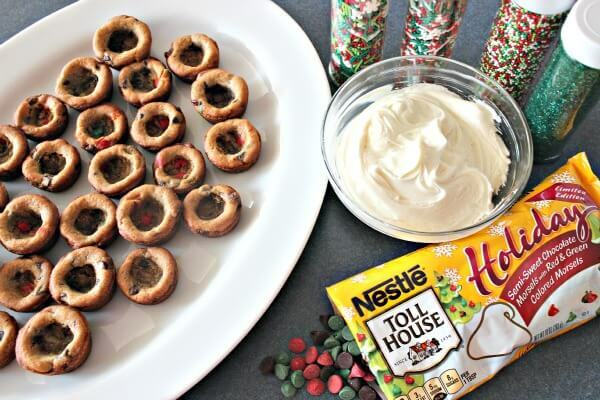 Find even more holiday baking inspiration - follow Nestlé® Toll House® on Pinterest, Instagram, and Facebook. They look so festive and fun. And I bet they taste heavenly. My sweet tooth thinks so too. Looks so easy. Can I follow you?